We’d love your help. Let us know what’s wrong with this preview of The New Way Things Work by David Macaulay. To ask other readers questions about The New Way Things Work, please sign up. The drawings are too messy. It's nice that this book is organized by principle of operation (lever, pulley, etc.) rather than function. But the illustrations don't really illustrate things very well-- especially for machines where you need to visualize all 3 dimensions. Whatever happened to electronic paper? This book would be awesome if the diagrams were all animated. Sure you could go to a web site, but resolution/portability are so much better with a real book. You can't read the internet in t The drawings are too messy. It's nice that this book is organized by principle of operation (lever, pulley, etc.) rather than function. But the illustrations don't really illustrate things very well-- especially for machines where you need to visualize all 3 dimensions. I cannot recommend this book more for readers (of all ages) who are interested in the science behind machines. If technology and machines are not your definition of fun, you might just discover a new interest after reading this. Usually, books that explore how things work are intense and the reader is at risk of information overload. In this book though, a parallel theme featuring comical adventures of woolly mammoths helps to (ironically) lighten the weight of information. Besides the endearing I cannot recommend this book more for readers (of all ages) who are interested in the science behind machines. If technology and machines are not your definition of fun, you might just discover a new interest after reading this. Usually, books that explore how things work are intense and the reader is at risk of information overload. In this book though, a parallel theme featuring comical adventures of woolly mammoths helps to (ironically) lighten the weight of information. Perfect for the budding engineer, or even if you're just curious. Everything from levers and gears to how zippers work to hydrofoils, nuclear power and technology in outer space. This is a nice thick book and is almost a graphic in how many illustrations it has. Sure some of the computer and space technology they cover may be outdated now, but because the book is mostly principle-based, working everything back to the basic components, it's still useful. This is a neat book explaining all that high and "techy" stuff which can be so hard to comprehend---until now. The Author and Illustrator, David Macaulay, really did a great job on this. It seems as if it's a long book (400 pgs.) but there so many illustrations it actually isn't too lengthy, and trust me, even if you're like me and aren't "techy", this book is not boring at all. Very enjoyable and a great way to introduce children to the Way Things Work! Covering everything from the wheel to nuclear fission, this book gives descriptive yet concise summaries of how things work. Instead of organizing inventions chronologically or by complexity, the book is divided based on the components used in an item; for instance, the plow and the zipper are grouped together as they both employ wedges. The illustrations may be my favorite part of the book as they clearly depict even the most intricate devices with small touches of humor scattered throughout. This is a great reference book. I enjoyed how the concepts were organized and built upon each other. The mammoth mascot is so cute! The age of the Internet and its wealth of frequently updated information may make books like these somewhat out of date. Still, I recommend this resource to teachers looking to stock their classrooms, school and public libraries, and young readers interested in mechanical topics. I read this book recently, and it was pretty good. I learned a lot about how things work, in a fun way. The illustrations are good, and they teach stuff in a fun way. The drawings with mammoths and the simple machines made me laugh, and the long reading sections were interesting to read as they were partly fictional. This book is a very helpful guild to many of my questions and many science projects. It has detailed illustrations and is surprisingly interesting. 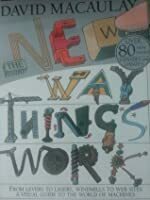 The new way things work explains a lot of things about our daily lives and is very informative. The mammoths make this book at first. But really, the amazingly simple yet thorough explanations on how everything around us works truly make the book. It's so fun you don't even realize how much you're really learning. My favorite part is Bill's gates. The most complete beginners guide to physics used in everyday life that is accessible and entertaining enough to read as a bedtime story for primary age kids. Not too basic for middle years- a thorough course with excellent pictures for concepts. My sons love these books. It's a great way to get them into nonfiction. Glad to know these are out there to 'splain things to us. Lots of information. I like how illustrations accompany the text to help explain how things work. Great for kids wanting to know about science and engineering. This book is THE COOLEST. Good for children or adults or literally anyone (including woolly mammoths.) Also there is a NEW new one out? It's probably amazing too. You can learn a lot of really cool things from non-fiction books. Non-fiction is fact based and should be unbiased but isn’t always. It could include cross section books, true stories, informational books or how to’s. The subjects could be historical events, science, geography and culture or interesting facts. Do you know how a photocopier works? The New Way Things Work, by David Macaulay is about going behind the scenes of very simple to very complex mechanics and science. The book is about how You can learn a lot of really cool things from non-fiction books. Non-fiction is fact based and should be unbiased but isn’t always. It could include cross section books, true stories, informational books or how to’s. The subjects could be historical events, science, geography and culture or interesting facts. Do you know how a photocopier works? The New Way Things Work, by David Macaulay is about going behind the scenes of very simple to very complex mechanics and science. The book is about how man-made things function. It also shows how corporations and big industries work. Some of the things it talks about are photocopiers, an atom bomb, a supermarket and a computer along with many other things. The New Way Things Work has different sections or categories and in each category there are different mechanics and objects on each page. The New Way Things Work is an illustrated cross section book with diagrams and graphics. The book has a table of contents that leads to the beginning of each section and a glossary/ index and technical terms at the end. Mammoths make an appearance in almost every diagram which adds humor to the text. fun but why mamoths? fuled with outdated detail, still a good read for someone interested in how things work. The New Way Things Work, David Macaulay's updated edition of The Way Things Work explains many advances in science and technology. With the addition of the dim-witted wally mammoth, Macaulay explains very intricate concepts fairly simply. David Macaulay’s The New Way Things Work is a comprehensive encyclopedia of technological advancements from locks and keys and can openers, to hydraulic presses and microchips. 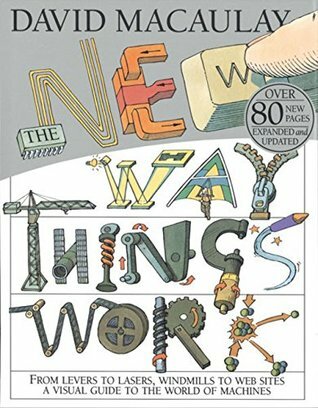 The book is broken down into chapters by technology: the wheel and axle, pulleys, sp The New Way Things Work, David Macaulay's updated edition of The Way Things Work explains many advances in science and technology. With the addition of the dim-witted wally mammoth, Macaulay explains very intricate concepts fairly simply. David Macaulay’s The New Way Things Work is a comprehensive encyclopedia of technological advancements from locks and keys and can openers, to hydraulic presses and microchips. The book is broken down into chapters by technology: the wheel and axle, pulleys, springs, etc. Each concept is explained very simply with a fairly dim-witted woolly mammoth. This work would be wonderful for students ages 10-12. The images in Macaulay's book make the explanations so much clearer: the words are all placed in the background of the image. Each part of the drawings is labeled with its name and a short explanation. Macaulay’s illustrations are very complex, drawn in pen-and-ink style. His mammoth is recurring throughout the book, and appears on most pages. His inclusion of the mammoth makes the book accessible to younger readers by adding elements of fiction to an explanatory text.The technologies are broken down easily and the table of contents reflects this: there is a table of contents at the beginning of the book (showing the different parts) and one at the beginning of each part (showing more narrow categories for the technologies within. All of this helps make the informational text more engaging and appealing to younger readers. Brief description-Local author, David MacCaulay, has updated his illustrated reference book on the world of machines. Highly detailed pictures of machines, are interspersed with whimsical Mammoths that help illustrate the purposes inherent in the machine/concept being discussed! Identify at least 2 characteristics of this genre and subgenre and discuss how they appear in your book- Chance (page 117) notes that some books in this genre at first present as picture books. But a closer look at the length and subject matter show that it is written for young adults. This is true of this volume of Macaulay's work. The pictures are highly detailed, and the labels and text are highly technical. Supportive feature (Chance 117) include large detailed picture of the machine being explained, index, table of contents, and the dates of the machine's invention. In what ways and how well does the book as a whole serve its intended audience? - The books serves young adults (and adults!) well by providing a clear explanation of the the machines being demystified! In addition, a humorous intertwined story about wooly mammoths using the technology lighten the information, which some might consider "dry". This book is AWESOME! As a Technology Teacher, I use this as well as the previously released way things work to create assignments. Wonderful resources that kids will spend entire class periods looking through. I call it an engineer's (and a teacher's) dream book - as it explains how things work very practically and with great pictures (and woolly mammoths! )...From toilets, to nuclear warheads. This is an amazingly comprehensive introduction to the workings of hundreds of machines, from levers to televisions. As with most of Macaulay's books, brief texts are accompanied by informal but detailed sketches that are both informative and fun to look at. This book is great for browsing or as a reference book. A fantastic compilation with lots of diagrams and relatively basic information on how things work. While explained in a basic way, some concepts are complex. This is a book for someone with a natural engineering mind who likes building things, or a science teacher. A wide array of gizmos and machines (quite extensive) and how they work. Oh boy, a book you can pore over and over and over! My kids ate this book up, and went and did some research on their own after reading parts of it. It's a great book, and the mammoth cartoons added character. I checked to make sure my kids took the mammoth with a grain of salt, and they just rolled their eyes at me, so that wasn't a problem. I’ll be honest, I didn’t read every entry in this book. But that is because the breadth of the information is simply amazing. Colorful, vibrant, and humorous even, it really is the perfect book to leave sitting in a classroom for a curious reader. Recommends it for: The curious. Stop. Put down your phone. Don't call the library to ask how that toaster works. Check with this book first. Satiate your curiosity. Feel empowered. Be amused at the witty illustrations. Breathe. Feel relaxed. Put down the phone. Perused before giving as a gift. We heard Macaulay speak at a Book Fair in Vermont this fall. Fascinating to hear him describe the creation process for these amazing books. The "little" Mammoth is a fun guide through the pages.